St. Louis, MO (March 2014) -- Behind every mesothelioma case number is an individual and their family and friends. Further, they are supported by a team of attorneys and staff that fight for justice on a daily basis for those exposed to asbestos. The law firm of MRHFM hosted its first annual client appreciation day in March 2014, where individuals, their family and the firm’s staff came together to share, understand and learn more about the victims of mesothelioma. The stories shared brought inspiration and encouragement to everyone in attendance. Over 60 people including MRHFM attorneys, staff, clients and their families were in attendance at MRHFM’s client appreciation day. People wore white ribbons in remembrance of those that have been lost to asbestos related diseases. The presentation included videos, pictures and testimonials from clients and their families about their experiences battling mesothelioma and the legal process involved. Several attorneys also spoke about their clients and the impact their work has on their daily lives. MRHFM is planning to host more client appreciation events in the future, as the first one was a success for everyone involved. 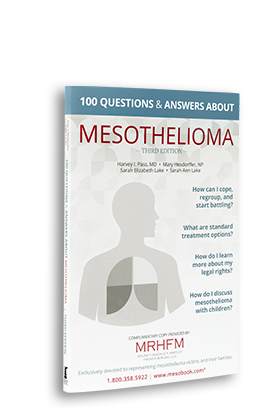 For more information about mesothelioma, request a free copy of “100 Questions & Answers About Mesothelioma” at http://www.mesotheliomabook.com. For a free consultation with an experienced mesothelioma attorney, contact the legal team at MRHFM today on its website or by calling 866.373.5000. MRHFM is the largest firm exclusively devoted to helping mesothelioma victims and their families. Maune Raichle Hartley French & Mudd, LLC is a mesothelioma law firm based in St. Louis, MO. With offices across the country, their size and exclusive focus on mesothelioma cases allows them to represent clients through the process as quickly as possible and maximize their clients’ recovery. The attorneys at MRHFM have represented thousands of victims exposed to asbestos. The firm has 29 attorneys across the country, 16 investigators, 7 client service managers, and additional support staff including paralegals and legal assistants. For more information about Maune Raichle Hartley French & Mudd, LLC, visit http://www.mesotheliomabook.com.